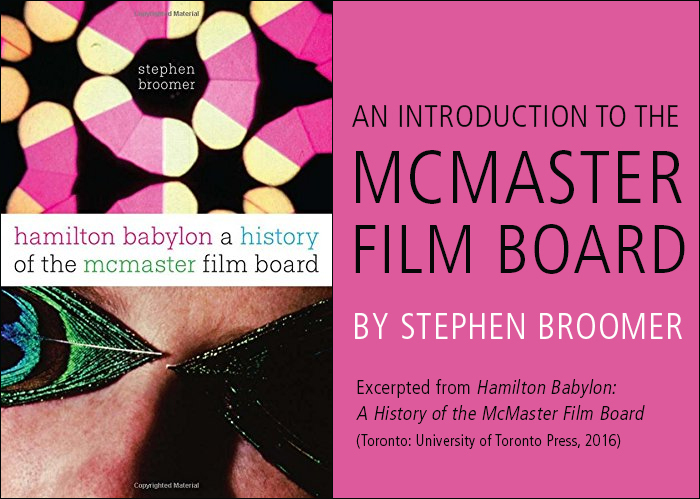 The McMaster Film Board began in 1966, the project of a small circle of friends who had been active in the campus arts festival, film screening society, and theatre troupe of McMaster University in Hamilton, Ontario. The Film Board was founded largely through the work of one man, John Hofsess, who upon encountering the avant-garde films circulating through the New York Film-makers Cooperative, planned to pioneer such filmmaking in Canada through McMaster’s campus arts community. Almost immediately, Hofsess and company ran afoul of the university administration, the student union, and the local police. The organization was repeatedly threatened with closure until it was shut down in 1968, after just two years of operation. A few months later, the Film Board resumed operations under new management, but with its revival, the nature of filmmaking at McMaster changed.